TORONTO -- Last Sunday, the American men fell to Canada in the baseball gold-medal game at the Pan American Games, losing in a chaotic, Little League-style finish when the tying and winning runs scored on two wilds throws on the final play of the game. This Sunday in softball, the U.S. women also lost against Canada in extra innings and missed out on gold. The U.S. women's baseball team, however, with players who rarely get any recognition for playing the national pastime and sometimes had to fight just for a chance to compete in it, beat Canada and brought home the title. And the squad hopes it did something more for their sport after the event's first Pan Ams appearance. 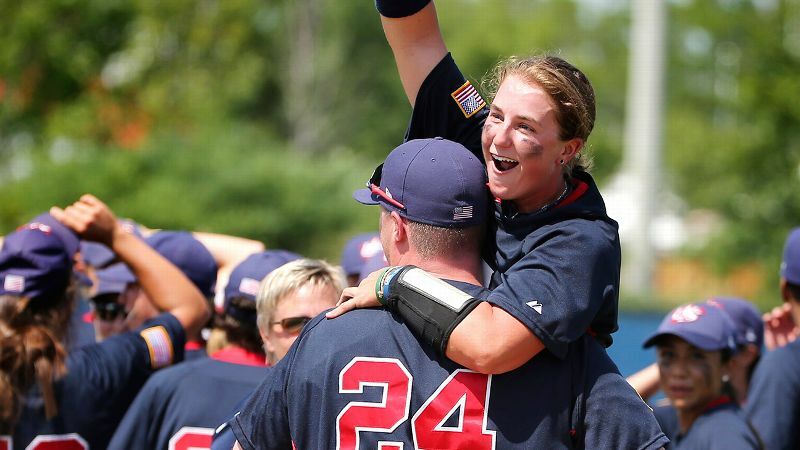 "It's beyond USA Baseball, it's women's baseball as a whole," U.S. manager Jonathan Pollard said after the Americans' 11-3 victory against Canada on Sunday. "The entire world needs to respect us and come see it and support it. Come see it and you'll see what great baseball these women are capable of playing." With a roster of players ranging from teenage high-schoolers, like shortstop Jade Gortarez, to 40-year-old firefighter and veteran outfielder Tamara Holmes, the U.S. scored four runs in the first inning and blew the game open with three runs in the fifth and another three in the sixth. After the victory, the players doused Pollard with ice water. "This is huge being part of the Pan Ams -- it's an honor being part of the first women's baseball competition here," said third baseman Michelle Snyder, who drove in two runs and had a double off the fence. "Just getting out here and putting us on the map and letting everyone know that girls can play baseball and they can play it well. We can do all the fundamentals and all the things guys can do." The U.S. women's softball counterparts were part of a different outcome, playing in a scoreless game that went into extra innings on a neighboring diamond. Under international rules that begin all extra innings with a runner on second base, Canada scored four runs in the top of the eighth for a 4-2 victory and won its first gold medal at the Pan Am Games since 1983. The U.S. had won the previous seven Pan Am titles and had also beaten Canada twice in round-robin play this tournament. 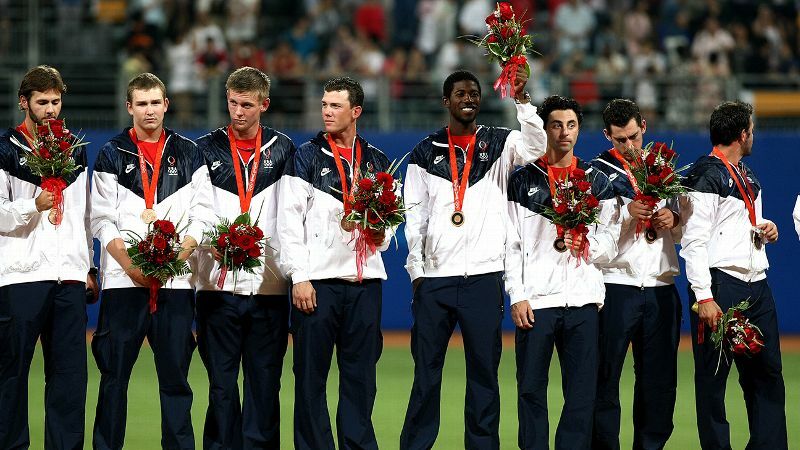 The United States won the first women's baseball gold medal at the Pan Am Games. "We've been on the losing end of many, many games against the Americans, and in some of them, we've taken some pretty good rubbings, including the round robin here," Canada softball coach Mark Smith said. "If we played each other in a best four-out-of-seven, they would win it. If we played each other 10 times, they would win eight. But today was winner-take-all and we got the job done." Meanwhile, the U.S. women got the job done in baseball. Part of that was due to their considerable talent -- starting pitcher Sarah Hudek (daughter of former major leaguer John Hudek) had two hits and three RBIs and also recently received a college scholarship to play baseball -- and part of it was the determination these women have needed to play a game that so often is reserved for men. Stacy Piagno, who pitched the final 3 2/3 innings in relief of Hudek to get the win, said she faced resistance to playing baseball while growing up. "Strangely enough, I had four different coaches in high school, one new coach every year, so I had to prove myself every year," she said. "Some coaches loved [me playing], some didn't love it. I had up years and down years, and I'm just grateful I was able to fight through it and be where I am today." Hudek said she hopes the Pan Am gold medal is a big step for women's baseball and the sport will one day get into the Olympics. That will be difficult considering that men's baseball and women's softball were dropped from the Summer Games after 2008. But if there is no Olympics in the future, what message did the team hope to give Sunday? "Fight for what you love and do what you love," Snyder said. "Don't be told that you can't. Girls can play baseball just like guys. Just keep following your dreams."